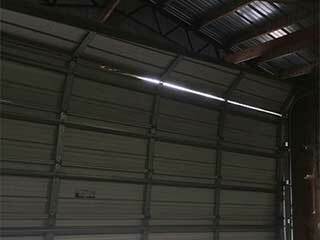 When most people think of problems with their garage doors, they picture broken springs, damaged panels, and openers that fail to work. However, there are a few problem that are often overlooked yet require immediate attention. While this is not a very common problem, a bent track can completely stop your door from being able to open and close properly. When you try to operate it, the door will only go so far before being stopped by the bent track. While some homeowners think they can take care of this problem with a hammer, such a "solution" will only cause more damage and will likely make you require more repair work later on. If you notice such a problem be sure to call our professional technicians to get it solved quickly and efficiently. Rust can be quite common in residential garages since they can be prone to dampness due to rainy weather or as a result of wet cars being parked inside them. A little rust on the springs, cables and tracks of your garage door is usually not a major cause for immediate concern. However, over time this rust can build up and the components will require replacement. Best to have our experts apply the appropriate maintenance procedures to ensure your system continues to operate flawlessly for as long as it possibly can. If you have had your springs replaced recently and they are not of the correct size then your door may be at risk of soon beginning to tilt. Aside from the dangers of these components suddenly breaking under the weight of your door, their tension will likely not be properly calibrated and your panels will be off balance. This can leave gaps in your entrance, as well as cause the entire door to collapse. Instead of trying to fix any problem by yourself, and potentially putting yourself and your property in harm's way, you'll want to call our experts at Garage Door Repair Las Vegas. We can resolve any situation with speed and efficiency.